I got up early to head for the Recreation Plantation in Lady Lake. I wanted to be there for the line dancing lessons at 9am. After packing, I couldn’t find my camera. I spent an hour and a half packing and repacking and scouring the house for my camera. Every time I passed the hermit crab’s cage I could see Boogie smiling at me. I found the camera under the bed but I missed the line dancing class. I met, my friends, Charlie and Sue, who were in charge of throwing a big party called Michigan Night. 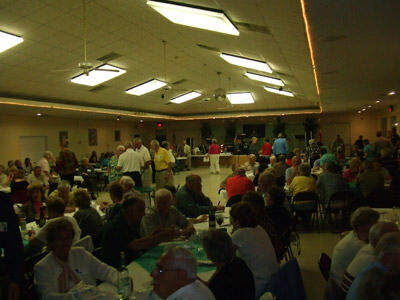 There were over 200 attendees, all Michiganders. It was a grand night. Down south Ellie (a lovely lady) was there, and I found the place was full of 16 year olds disguised as old codgers. There was a six piece band made up of guys who, were rock stars back in the 60s. We danced and sang the night away. 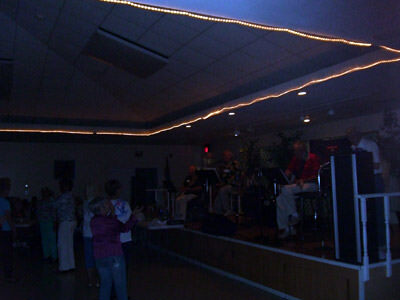 I watched the line dancers having fun. They were all ladies. I wished I had taken that morning class so I could have been out on the floor with them. 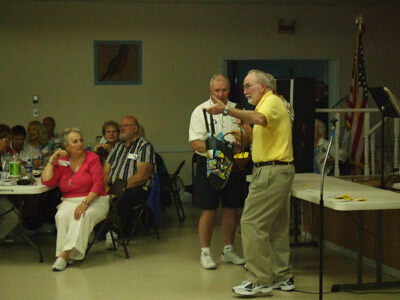 Charlie and Sue were the emcees and announced the winners of door prizes and raffle tickets. Charlie brought a bottle of merlot. I knew it was good homemade wine because I could see a few toenails at the bottom of the jug. By the end of the evening Charlie was having a hard time pronouncing the name Mackinaw, when announcing raffle winners. The lady next to me thought Charlie was doing a Foster Brooks impression. It was another good day. I slept at Charlie and Sue’s house after the party. I bought breakfast for my hosts and hit the road. I am heading west today and hoping for warm weather. I am writing this log in a Pannera Bakery at The Villages. It too is full of 16 year olds disguised as old folks.